I have figured out how to create image target "object"(s) dynamically from imported database as the first screenshot. However, I don't want to CREATE the image target objects, but want to just UPDATE the image database within ONE image target object. Is there a way that I can just update the image target not creating multiple image target objects? Your help would be very appreciated! Thanks in advance! ps. 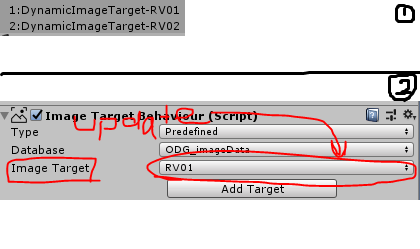 let say there are 100 images in my database, and if I create all the image target objects, then all of them are created in Unity Hierarchy as objects; that is not what we want... right? IIRC, All of the targets within a database will be enabled and if a corresponding GameObject will be instantiated. You can have a bit more control by making databases with a smaller number of objects and enabling the databases as you need them.